by Bert de Vries and Jeff DeKock. Women’s Co-Op member speaks at the opening of the Empowering Rural Women Project in January 2014. Photo by Paul Christians. The Umm el-Jimal Project, Open Hand Studios, and our partners continue to integrate the ancient archaeological site and modern community of Umm el-Jimal, Jordan. Therefore, we’re excited to report the launch of the Empowering Rural Women Project in January 2014. 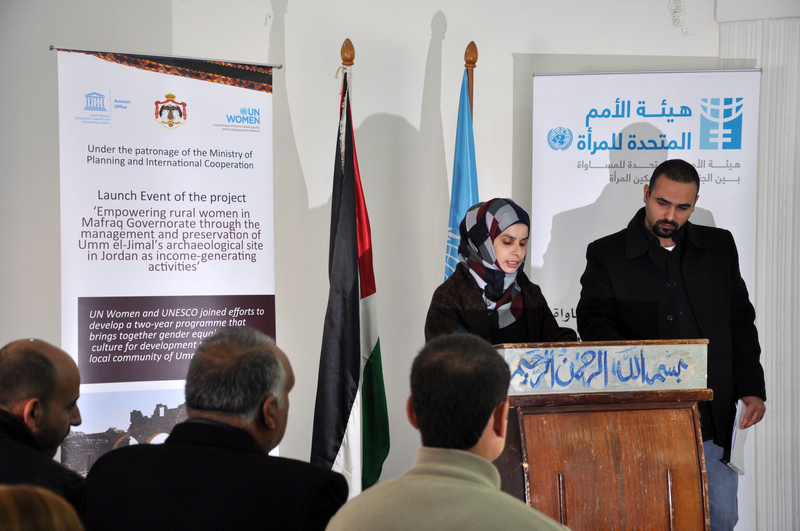 A joint program funded by UNESCO and UN Women and implemented by the project partners, it supports continuing development of the Umm el-Jimal Women’s Cooperative Society (UJWCS). Originally founded in 2010 by women from Umm el-Jimal, UJWCS recognizes local women as a key source of strength for their community. As such, the women’s empowerment project will help co-op members develop new ways to celebrate and promote the role of women in the cultural heritage and economic life of Umm el-Jimal. A main focus for the program’s first year is to provide materials, training, and support for local women to serve as tour guides for school groups and local groups, as well as to begin producing handicrafts traditional to northern Jordan’s rich history and culture. Some of the women will be employed as trainees in archaeology on the House XVII-XVIII Preservation Project this spring. Later phases of the project will add programs in food and hospitality, as well as small business development. 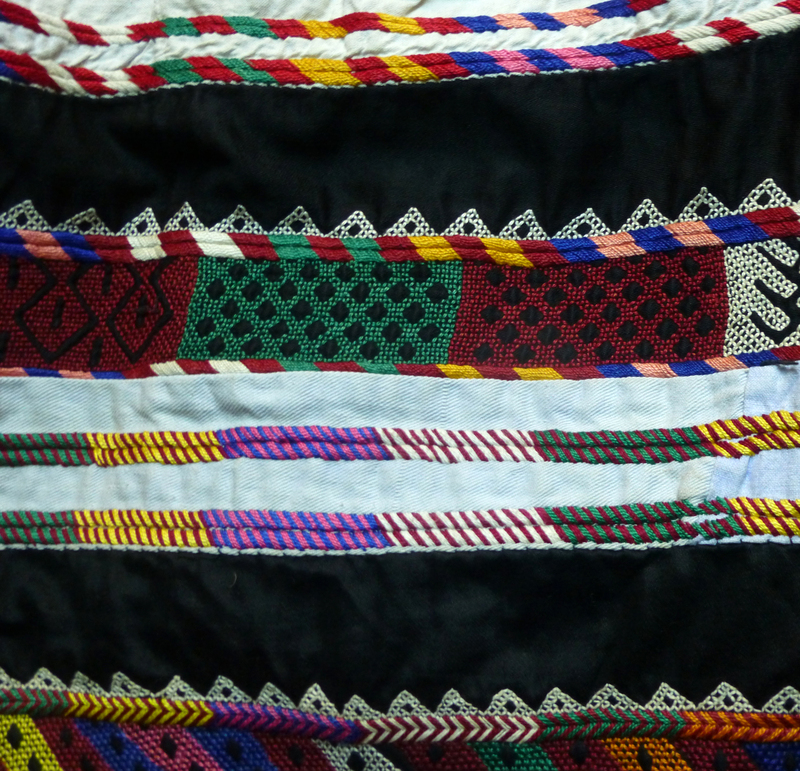 Traditional North Jordanian costume decoration. Photo by Sally de Vries. 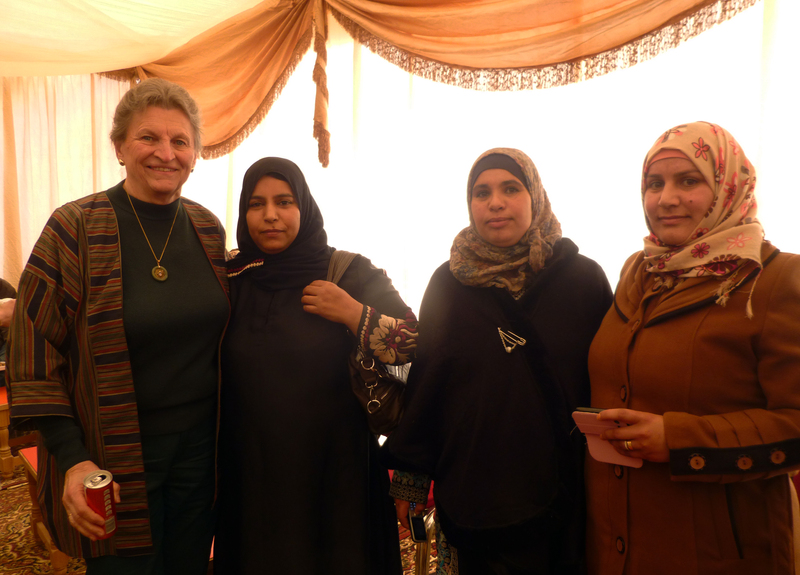 By bringing local village women into a very public job sphere, the Women’s Co-op is breaking new ground at Umm el-Jimal. The women will not only help preserve the ancient site, but also help transform the modern community into a skilled, self-sustaining, economically empowered group—able to open the doors to their history and invite guests from around the world to experience their heritage. Over the long term, Women’s Rural Empowerment will create job opportunities and local revenue in craft production and marketing, archaeological site maintenance, community tour guiding and conducting site visits for school classes. It will also expand local cultural knowledge: the region’s traditions, stories, and lifestyles will be preserved through the training of the women themselves, and passed on by them to their children, fellow Jordanians, and international guests. Thus this project is achieving two things at once: the women will benefit from the preservation of their own heritage, and the archaeological site will be preserved as an integral component of that communal heritage. Women’s Co-Op members and others in the audience. Photo by Paul Christians. 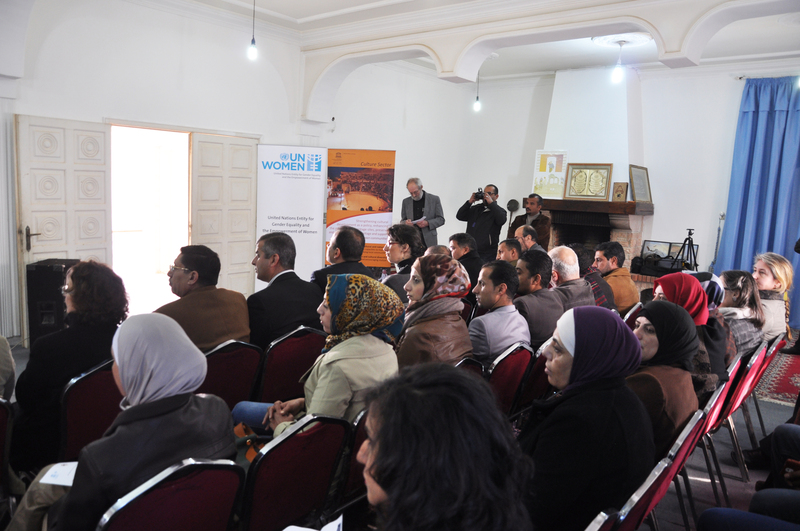 On January 18, 2014, the empowerment project had its formal opening in the heritage center at Umm el-Jimal. About 120 dignitaries and local residents gathered with the women to listen to hopeful inaugural speeches by representatives of the various agencies involved, including, among others, UNESCO, UN Women, the Department of Antiquities and the Ministries of Planning and Tourism. One of the group of thirty women who also spoke expressed her delight and excitement for this reinvigoration of the cooperative, as well as her hope that their empowerment would lead to careers for young women as they graduate from local schools. We feel that the large turnout indicates that the community, including its men, is ready to give its women the freedom to engage in publicly visible service careers. This Empowerment of Women Project is part of larger efforts to reunite the modern community of Umm el-Jimal with its ancient archaeological heritage. This linking of archaeology and community is the work of a partnership of the Umm el-Jimal Project (directed by Bert de Vries of the Calvin History Department and Archaeology Program) and Open Hand Studios (directed by Calvin alumni Paul Christians and Jeffrey DeKock). A new partner providing funding and expertise is Al Hima Foundation, a new Jordanian non-profit dedicated to community empowerment through heritage preservation. Sally de Vries and women at celebration. Photo courtesy of Sally de Vries. The Women’s cooperative will work in close cooperation with the “Black Jewel Cooperative Society,” a local group including long-term staff members of the Umm el-Jimal Project and unemployed young men chartered in 2013 for the express purpose of providing gainful employment in archaeological site management at Umm el-Jimal. They and some of the women will be employed and trained for on-site work in the upcoming field seasons to preserve a large building and revive the ancient water system beginning this April. For further descriptions of the whole conglomerate of current projects, see the Umm el-Jimal Project pages on community, conservation, and the House XVII-XVIII complex. We are exceedingly grateful for the direct financial and logistical support for the Women’s Empowerment Project provided by UN Women, UNESCO and Al Hima. We’re also most grateful for the financial support for site preservation by funding agencies like the Ambassadors’ Fund for Cultural Preservation, for such field projects provide the work and salaries necessary for the buildup of a skilled career pool among the women and men of the Umm el-Jimal village. Group tour of Umm el-Jimal concluded the formal opening of the Women’s Empowerment Project. Photo by Paul Christians. Jeff DeKock (Co-director, Open Hand Studios) is Assistant Professor of Communication Arts at Trinity College in Chicago, specializing in Visual Communications in which he majored at Calvin College. Jeff directs and teaches the Trinity College Semester in Nairobi, Kenya, where he lives with his wife Ashashka and daughter Layla. As co-director of Open Hand Studios, Jeff is the major contributor to visual production on the Umm el-Jimal Website. This entry was posted in Bert de Vries and tagged archaeology, Jordan, Umm el-Jimal, UN Women, UNESCO, women, Women's Empowerment Project. Bookmark the permalink.